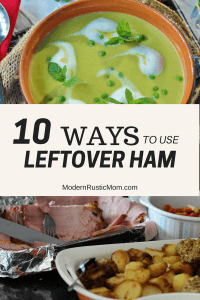 Whatever the occasion or number of guests, there always seems to be enough leftover ham for another meal. For our Easter dinner, we made a honey baked ham with sliced pineapple, glazed baby carrots with maple syrup and brown sugar, baked potatoes, salad, stuffed peppers (thank you, Sister! ), and roasted sweet potatoes. For dessert, my mom brought her famous almond amaretto cake. D-E-L-I-S-H. The beauty of a ham is that it is already cooked and, yet, we still struggled to get our ham up to 140°F. We followed the direction of tenting it in aluminum foil and putting on a rack over a cup of water then cooking at 325°F for 15 minutes per pound. We end up putting the heat up and trying it on convection for 30 minutes and that did it. Luckily, our other items were less fussy and dinner came together nicely. I think we need to get an oven temperature gauge to make sure the temperature is staying consistent. We all had full bellies but there was still at least a two or three pounds of ham leftover. Even after packing my lunches for work for the week, there was still a ton left. (p.s. I adore these meal prep containers for packing my lunch. They’re easy to clean and stack nicely in the drawer.) 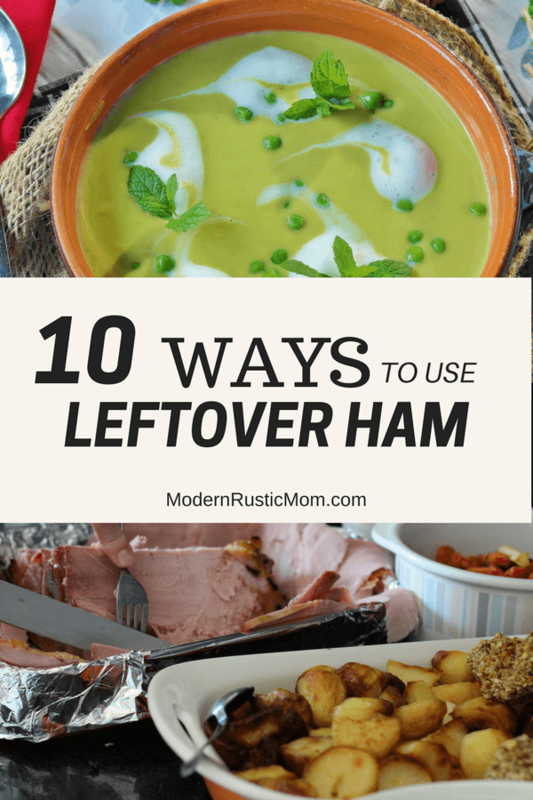 So instead of wasting it, here are a few ideas to use up the leftover ham. Ham really shines with eggs, cheese, and/or bread. Any combination thereof should work. Luckily, it plays nicely with fruit (t hink pineapple or apple) and vegetables (try broccoli or peas). If you’ve had all of the ham you can muster, feel free to freeze some to throw into a meal weeks from now. I prefer to cut it into mostly uniform small chunks and place into freezer bags at one-cup portions. Make sure to get as much air out of the bag as possible to limit the freezer burn since there is a lot of water in ham. Write the date, contents, and quantity on the outside of the bag so you can easily put it to use. Add it to your freezer inventory so you don’t forget. What do you like to make with leftovers?